This recipe is from Big Ed from Texas. It’s well known that many people dislike Brussels sprouts. Maybe it’s the smell, maybe the texture, but most likely – it’s the bitter taste, especially if they’re not prepared properly. But when Brussels sprouts are prepared well, they can win people over. And they’re worth eating because of their extraordinary health benefits: they help lower cholesterol, they’re high in fiber, and they’re known to be cancer fighters and DNA protectors. Here’s a recipe I pulled together that’s always been popular with family and friends. Blanch sprouts in boiling water for 2 minutes, remove, drain, and place in ice bath to stop cooking. Drain again. 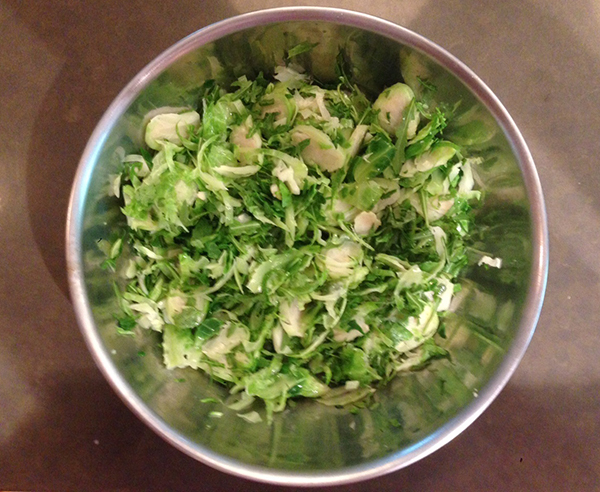 Push Brussels sprouts and arugula through a food processor with slicing attachment. Do not puree. Sear pine nuts in dry skillet, stir occasionally until golden, then set aside. Sauté shallots in olive oil and butter until translucent, about 2-3 minutes. Do not brown. Mix Brussels sprouts and arugula mixture with shallots. Add couple tbs. of water, salt, and pepper. Cook about 1 minute until tender but not soft. Add pine nuts, mix and serve.